After a difficult end to 2018, the equity market rallied broadly to begin the New Year, with the S&P 500, Russell 2000 and MSCI EAFE indices up 11.4%, 15% and 7.6% respectively. Robust earnings, low unemployment and steady business and consumer confidence are all positives for the equity markets. Another very strong factor is the evolving landscape for monetary policy and bond yields. 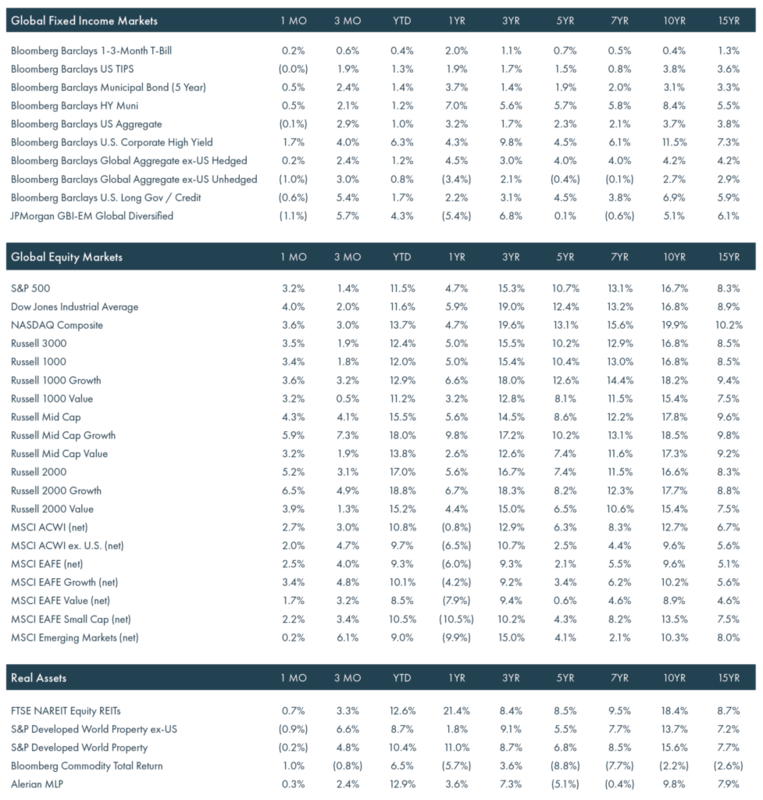 The Federal Open Market Committee (the Fed) raised rates four times (a total of 100 basis points, or 1%) in calendar year 2018, and the overnight target Fed funds rate (upper bound) currently stands at 2.50%. At the press conference following the December meeting, economic projections of Federal Reserve board members and bank presidents were released (the so called ‘dot plot’), showing the consensus view was for the target Fed funds rate to touch 3.25% (upper bound) in 2019. Market participants agreed with this assessment and the markets for futures on monetary policy at that time were pricing in additional rate hikes from the Fed. Market participants took these comments to heart and adjusted accordingly. Since the Fed last raised rates on Dec. 19, short and intermediate maturity (2-10 years) declined 15-20 basis points. The markets for Fed funds futures are currently pricing in a higher probability of an interest rate cut than an increase in calendar year 2019. Stable-to-easier monetary policy historically has been a strong bias towards “lower” yields. Other factors also argue that bond yields will remain relatively stable this year. Both overall and core inflation (as well as inflation expectations) declined in recent months and remain within the Fed’s comfort zone. Slowing domestic and global growth are keeping inflation in check even as a tight labor market is driving up wages. 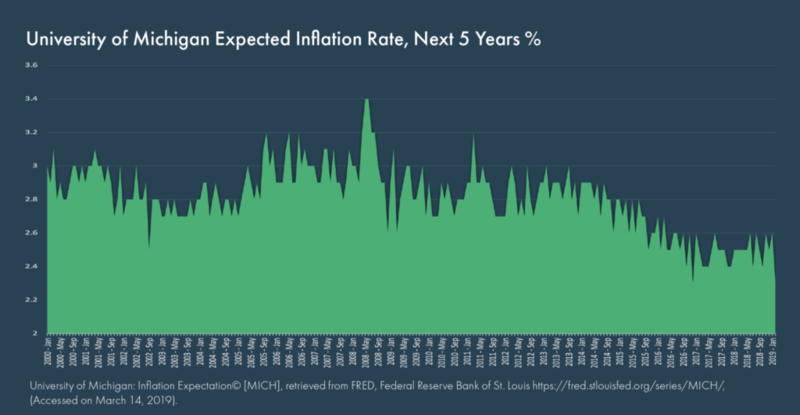 The latest reading from the University of Michigan shows the expected inflation rate for the next five years is 2.3% (see chart), a level that shouldn’t be a concern for monetary policy makers. Globally, developed market bond yields also declined in recent months. The closely watched German 10-year government bond is threatening to fall into negative territory and was recently trading at a yield of five basis points (0.05%). The French 7-year note has a similar yield, while Japan and Swiss 10-year maturities currently trade at negative yields. With the Fed apparently on hold for the time being, slowing global growth and low global bond yields, one concern for the stock market appears to have been sidelined for the time being. The Fed increased rates four times in 2018, equities struggled and there were concerns that more increases could dampen the markets again this year. A stable Fed at what is still a relatively easy policy stance helps create a friendly backdrop for financial conditions, the economy, and the markets. Longer-dated U.S. Treasury yields rose and the yield curve steepened due to stronger-than-expected GDP data and diminished concern over tariff issues with China. High yield corporate bonds were the best performing fixed income asset class as lower quality credits continued to benefit from healthy risk appetites. Municipal bond prices benefitted from constrained supply. International unhedged and emerging markets debt posted negative returns as the U.S. dollar rallied. U.S. equities continued their advance as fewer macroeconomic headlines resulted in positive sentiment. Growth broadly outperformed value during the month. Industrials, Utilities and Technology outperformed the broader index. 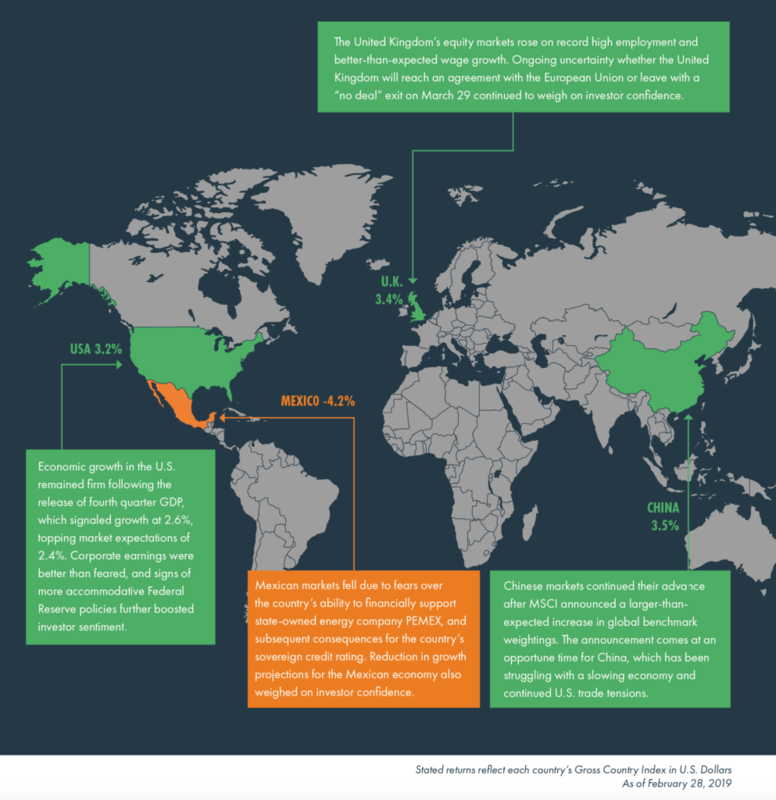 Developed international equities advanced, but were subdued by weak economic data and concerns of slowing growth. Emerging market equities posted modest gains as attractive valuations and a backdrop of economic reforms in China supported returns. Real assets were higher for the month with the exception of international REITs, which fell moderately due to global growth concerns. Commodities were the best performing real asset class for the month. Lower-than-expected oil supply was supportive for prices throughout the period. MLPs advanced modestly on higher oil prices, but mixed earnings reports, rising interest rates and pipeline delays muted returns. © 2019 Moneta Group Investment Advisors, LLC. All rights reserved. These materials have been prepared for informational purposes only based on materials deemed reliable, but the accuracy of which has not been verified. Past performance is not indicative of future returns. These materials do not constitute an offer or recommendation to buy or sell securities, and do not take into consideration your circumstances, financial or otherwise. You should consult with an appropriately credentialed investment professional before making any investment decision.